Shrek is one of the most successful and long lasting kid’s franchises I can think of and with the new “Puss in Boots” movie opening this weekend, I thought it would be fun to look at all the movies and spinoffs. P.S. I’m not including DVD shorts like “Donkey's Christmas Shrektacular”, “Shrek’s Thriller” or “Far, Far Away Idle”. I’m one of the few kids that didn’t love the first Shrek, I thought the plot was dumb, standard and I couldn't understand why everyone loved it so much. Well, it’s certainly grown on me over the years, the characters are charming and there’s a nice sense of hummer. I just don’t think that it’s the master piece everyone claims it to be. This was one hell of a fun special, the story was honestly more exciting than the first movie, it’s great to have Farquaad as the villain one last time, I love all the creative visuals and it made for a really entertaining and fast passed 3D experience. If you have the opportunity to see it at the theme park then definitely check it out and if not then just settle for it on DVD. Hands down the best in the series, the casting is perfect, the returning characters are back and better than before, only this time we get some outstanding new supporting characters to join the fun, most notably Puss in Boots who completely steals the show. The animation is great, the story is sweet and romantic and best of all, this film is one of the funniest animated kids films I’ve ever seen and worthy of being called one of the funniest comedies ever made. 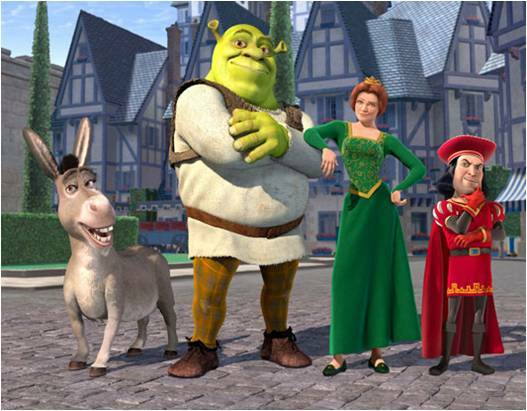 “Shrek 2” is simply one of the best sequels to a kid’s film ever. I’ve seen worse films but it is a disappointing follow up to an excellent film. The jokes were to over blown, the plot was pointless and had no bearing on our lead character, most of it was embracing and the characters just weren't as fun. One of the worst holiday specials I’ve ever seen. Where suppose to look at Shrek as a jerk when really he’s the victim. The jokes are tiered, lacks music and there’s just nothing charming or magical about this holiday stinker. The short film “Donkey's Christmas Shrektacular” (on the “Shrek Forever After” DVD) was a better holiday treat then this. Not as good as “Shrek 2” but it’s one of the few children's sequels that I liked more than the original. 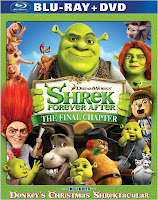 It may not be that funny but everything that made Shrek great is celebrated in this very entertaining, alternate reality film. It’s just an excellent cheery to be placed on top of the series and brings everything to a satisfying conclusion. It may not be the most recommended Halloween special but as far as Shrek spinoffs go, this is one of his best and a huge improvement over his terrible Christmas special. The animation was fantastic, the jokes were fast and funny, there are plenty of references on things I actually liked from the first film and the many different stories told in this special are inventive and fun. What it lacks in originality, it makes up for with wit, energy, great animation and plenty of charms. Plus it makes for a terrific film adaption for my favorite character in the series. See my full review for more details. The best way to describe this film is cute, unbelievably cute, it’s just Puss in Boots becoming a father figure to three rebellious young kittens and watching them go on a fun little adventure, so honestly, cute is all you can really say about it.